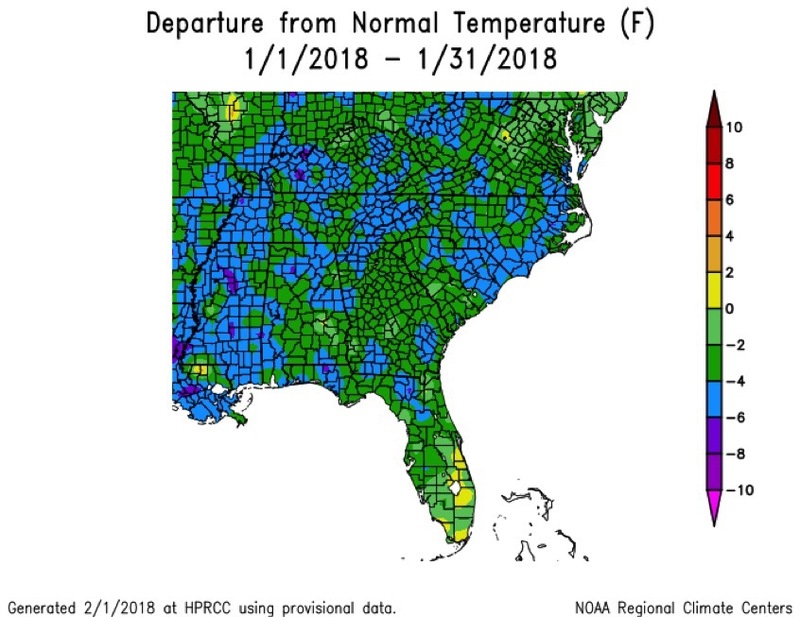 Georgia saw a cooler-than-normal start to the year, and most of the state posted average temperatures between 2.5 and 4 degrees below normal. With cool, dry air expected to dominate Georgia’s climate in coming weeks, there is a chance that drought could continue expanding across the state and may persist through the spring. The below-normal precipitation caused the expansion of drought across the state, and extreme drought was introduced to a large area of southwest Georgia. Drought now covers 18 percent of the state. The dry conditions are expected to continue for the next few months and no significant relief is expected. Dry weather has already impacted forage production in parts of the state, while the cold has impacted some onion and vegetable crops in the southern half of Georgia. The cold weather has provided a good number of chill hours for fruit trees, however. A number of record lows were tied or set in January. Athens reported a record nighttime low of 11 degrees Fahrenheit on Jan. 2, lower than the old record of 12 F set all the way back in 1887. Savannah reported a record-low daytime high temperature of 30 F on Jan. 3 that broke the old record of 32 F, also set in 1887. Brunswick reported a low of 25 F on Jan. 4 that broke the old record of 26 F set in 2016. On Jan. 2 and Jan. 3, Savannah recorded record-low daytime high temperatures of 37 F and 32 F, which beat the old records of 42 F set in 2008 and 36 F set in 1979. Jan. 3 marked the fourth time Brunswick has been at or below freezing for an entire day, according to the National Weather Service. - In Albany, the monthly average temperature was 46.8 F, 2.5 degrees below normal. - In Alma, the monthly average temperature was 47.2 F, 3.5 degrees below normal. - In Athens, the monthly average temperature was 40.9 F, 2.6 degrees below normal. - In Atlanta, the monthly average temperature was 40.4 F, 2.9 degrees below normal. - In Augusta, the monthly average temperature was 43.2 F, 2.3 degrees below normal. - In Brunswick, the monthly average temperature was 48 F, 3.5 degrees below normal. - In Columbus, the monthly average temperature was 44.7, 2.5 degrees below normal. - In Macon, the monthly average temperature was 43.4 F, 2.9 degrees below normal. - In Rome, the monthly average temperature was 37.8 F, 3.3 degrees below normal. - In Savannah, the monthly average temperature was 46.7 F, 2.8 degrees below normal. - In Valdosta, the monthly average temperature was 46.5 F, 3.9 degrees below normal. These cooler temperatures mixed with moist air over parts of the state contributed to two snow events over the course of the month. Early in the month, snow fell in south Georgia. On Jan. 3, Alma saw 3 inches of snow and Savannah saw 1.2 inches. Savannah hadn’t seen that much snow since the city saw 3.2 inches on Dec. 23, 1989. Valdosta received 0.6 inches. The 1.2 inches of snow in Savannah on Jan. 3 was a daily record for that city. The 3 inches in Alma was the first snow seen on that date in Alma, and that city’s second-highest snowfall ever. The Alma record snowfall of 4.4 inches was set on Feb. 10, 1973. On Jan. 17, a separate storm brought snow to northern parts of the state. Atlanta received 2.4 inches of snow; Athens, 1.1 inches; Columbus, 2 inches; and Macon, 1 inch. Albany also received 0.1 inches in this storm. All of the monthly snow totals were the result of single-day events. Atlanta, Athens, Columbus and Macon all set daily snowfall records on Jan. 17. Atlanta received a trace of snow on that date in 2016, but for the other cities listed, it was the first time snow fell on that date. Athens saw the highest monthly total precipitation — 4.63 inches, 0.58 inches above normal, according to National Weather Service reporting stations. The lowest monthly total precipitation was in Savannah at 1.07 inches, 2.63 inches below normal. - Albany received 2.87 inches of precipitation, 1.95 inches below normal. - Alma received 1.55 inches, 2.71 inches below normal. - Atlanta received 3.26 inches, 0.94 inches below normal. - Augusta received 2.09 inches, 1.82 inches below normal. - Brunswick received 3.47 inches, 0.25 inches above normal. - Columbus received 1.60 inches, 2.25 inches below normal. - Macon received 2.14 inches, 2.10 inches below normal. - Rome received 1.22 inches, 3.60 inches below normal. - Valdosta received 2.07 inches, 2.50 inches below normal. According to Community Collaborative Rain, Hail and Snow Network volunteers, the highest daily rainfall total was 4.82 inches, recorded near Dillard in Rabun County on Jan. 12, followed by 2.64 inches on St. Simons Island in Glynn County on Jan. 29. The highest monthly precipitation amount — 10.22 inches of rain plus melted snow — was recorded by the same Dillard observer followed by 5.85 inches from a Rabun Gap observer. Both of these were recorded in mountainous Rabun County in northeast Georgia. An observer in Newnan of Coweta County received an estimated 4.5 inches of snow on Jan. 17, the highest daily snowfall recorded in the state this month. This was also the highest monthly amount of snow, followed by 4.1 inches measured by an observer in Jesup in Wayne County. Due to last month’s cold weather, it is not surprising that the only local storm reports came from freezing rain, sleet, severe wind chills and other wintry weather. No tornadoes or damage from high winds was reported. There’s an enhanced risk that warmer-than-normal conditions will occur in February, and for the period from February through April, especially in the southern half of the state. Some cold outbreaks are still likely, however. Southern Georgia will see an increased chance of drier-than-normal conditions for the next three months due to the continuing effects of the current La Nina. For more information, visit the Climate and Agriculture in the South East blog at blog.extension.uga.edu/climate/, like Southeast Ag Climate on Facebook, or follow @SE_AgClimate on Twitter. Email your weather and climate impacts on agriculture to pknox@uga.edu to share on the blog.